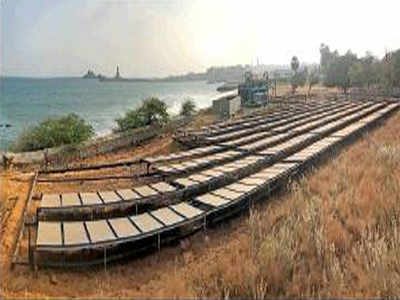 A team of IIT-Madras has set up India’s first solar-powered desalination plant in Tamil Nadu. 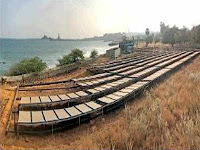 The plant, situated on a 120 square meter (sqm) area near Vivekananda Rock Memorial at Kanyakumari, has a capacity to generate 10,000 liters of fresh water a day. Professor A Mani of IIT Madras stated that at the plant, the surface seawater is pumped in a collector that traps sun’s radiation and converts it into heat. The sun’s energy is used to heat seawater, which is at 37 degree Celsius, to 70 degree Celsius and above. The hot water is then pushed into a flash chamber under vacuum and around one percent turned into vapour, which is sent to a condenser and cooled with sea surface water to generate fresh waterAs per the statement of IIT said, The freshwater generated by the plant has only 2 parts per million (ppm) of dissolved salts. For drinking, WHO recommends water with 500 ppm. So, we mix this water with local municipal water. According to the report, the Rs 1.22 crore experimental project is funded by the Ministry of Earth Sciences and will be soon inaugurated. Post Pulwama, Pakistan is suspect everywhere. Pak hand in staging terror attacks inside Bharat – in Chennai and Bengaluru to be precise - was seen clearly in a letter from Mohammed Sakir Hussain (a Sri Lankan National, an ISI spy, caught by NIA in 2014 at Chennai and lodged in the Puzhal prison, Chennai) to higher officials expressing his fear that ISI was bent upon finishing him since he had confessed his crime to NIA. ISI also wants him to backtrack on his confession during pending trial at Madras High Court. Hussain’s letter named Amir Zubair Siddique, a former Pakistan diplomat at Colombo mission, as his handler. Hussain had entered India, allegedly to carry out reconnaissance of the US Consulate in Chennai, Israeli Consulate in Bangalore and other installations. He is undergoing a five-year term since 2014. It is not only the fear for his life under threat, but also to his family members at Sri Lanka, has made sakir report about the looming danger to the authorities. After his petition to this effect, he was shifted to Cuddalore Prison in mid January. His family members in Sri Lanka have come under the protection of RAW reports say.